A stakes win to Adamantium capped a big day for Danny O'Brien at Flemington but the trainer will resist the temptation to back the sprinter up in the Group One Newmarket Handicap. Adamantium ($11) raced to a mid-race lead in the Listed Bob Hoysted Stakes (1000m) and despite rolling from the middle of the track to the fence, the gelding held on to defeat topweight Pago Rock ($6) by a head with Couldn't Agreemore ($6) a long head away third. The win came 40 minutes after the O'Brien-trained colt Shamus Award added an all-the-way Group One Australian Guineas (1600m) win to his Cox Plate triumph from the spring. Craig Williams won the feature on Shamus Award and his victory on Adamantium brought up a Flemington stakes race treble for the star rider after an earlier win on Mouro. Adamantium was dominant in two straight-track sprint wins in the summer of 2012/13 including the Group Three Standish Handicap (1200m), but he had to undergo a wind operation after an unsuccessful spring. "He's a talented galloper that's had his issues but we're getting on top of them and hopefully we can start to get him more consistent than we've seen," O'Brien said. "I'll probably resist the temptation of next Saturday, we're just finding our feet again. "He'll probably run in a Listed race at Sandown in three weeks and if he held his form we'd probably look at The Goodwood in May." 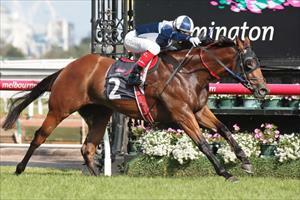 O'Brien has last year's Newmarket winner Shamexpress in next Saturday's 1200m Group One handicap.